Native to southern Europe and northern Africa and commonly cultivated in Europe and the U.S.. The branched, pale green, stem bears alternate, somewhat fleshy leaves with oblong to leaflets. 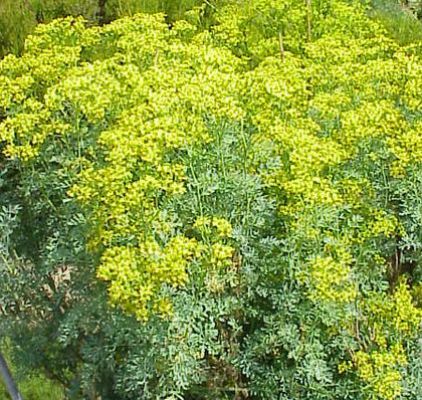 Small yellow or yellow-green flowers appear from June to August. Plant herbs in full sun to partial shade in the ground or in containers. Dig hole 2-3 times larger than the rootball. Mix in ¼ - 1/3 compost backfill, press gently and water deeply. Mulch with one inch of compost, bark or pecan shells, ect. Most herbs need deep regular watering, but do not keep wet and soggy and do not water every day.